What is a process in operating system? What are the process states? A process can be thought as a program in execution, but a program by itself is not a process. Process is nothing but a set of instruction to be executed. Multiple instances of a single process can be running at any given time and also a process may create sub-processes with time. Processes may need certain resources like, CPU time, memory, files and access to other devices. As being said, process is a set of instruction, it can be considered that a batch job is a process. CPU execute instructions in a process in a sequential manner, one instruction after another until the process is complete. A process is more than the program code. It includes the current activity which is the value of the program counter, and the contents of the processors registers, a process stack containing temporary data and a data section containing global variables. 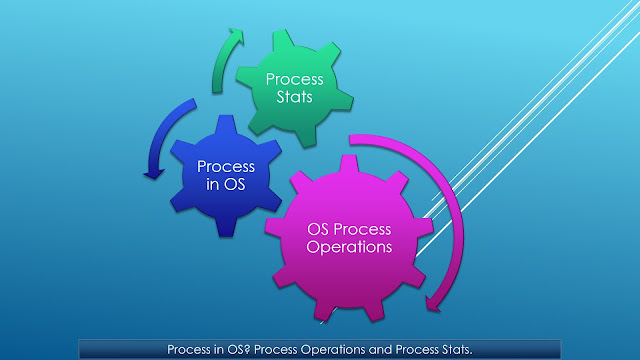 The operating system is responsible for the following operations in connection to process management. Running: Instructions from the process are being executed. Waiting: The process is waiting for some event to occur, like an I/O activity etc. Terminated: The process is completed.